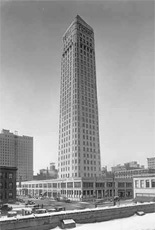 Below is the famous Foshay Tower in Minneapolis, as it first appeared in 1928-29. At that time, it was the tallest skyscraper between Chicago and the West Coast. This building was the original home of the Buildo Company. Hi folks, Doc here. 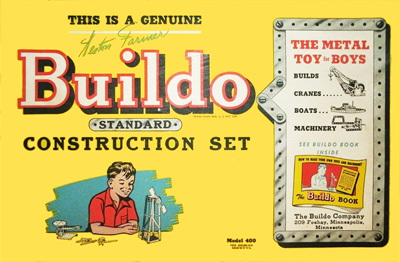 This time I want to talk briefly about yet another minor player in the mid-20th century contruction toy industry in the U.S.: Buildo. There is very little information to be had about Buildo it seems, except what can be gleaned from the products and advertising samples that remain, many of which are presented on this page (see images at right and below). 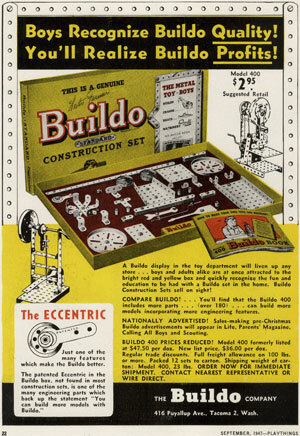 The Buildo product line appears to have been short-lived (1945-1947 roughly) and small in scope. 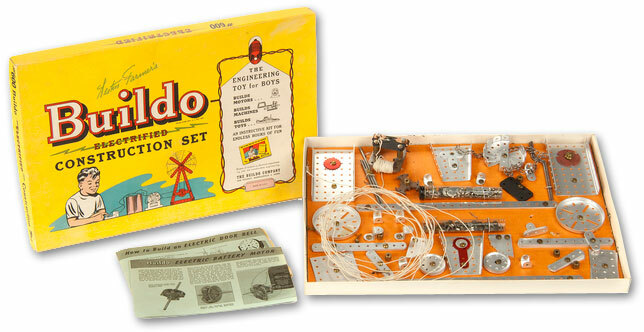 Examples of several sets were manufactured and advertised in the mid-1940s, including the Model 400 Standard Construction Set, the Model 600 Electrified Construction Set, and at least one other; photos of these sets are shown below. 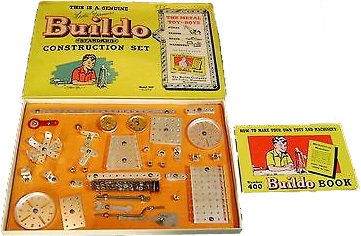 Interestingly, the sets are all branded as either "This is a Genuine Weston Farmer Buildo Construction Set" or, more simply, "Weston Farmer's Buildo Construction Set." 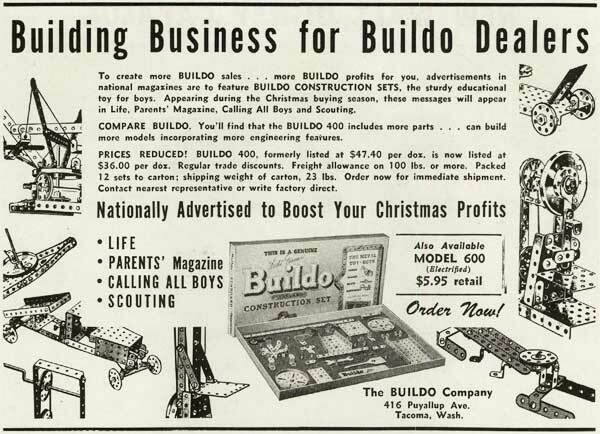 In addition, in at least one trade ad from 1946 this statement appears: "The Buildo Company - Weston Farmer, President." 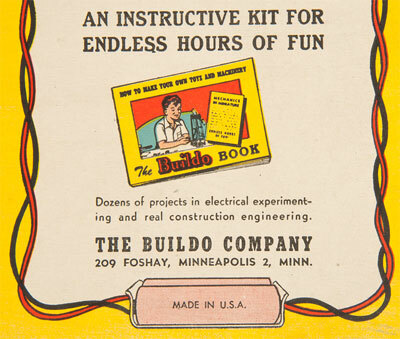 During 1945 qnd 1946, the Buildo Company was headquartered in Minneapolis (see the left sidebar below for more information). Research reveals that Minnesota was home to a man named Weston Farmer who worked as an engineer in that state for multiple companies through the years. His bio indicates that in later years he became well known in the pleasure boating world for his numerous popular wooden boat designs, but the same bio makes no mention of Buildo. Still, it seems reasonable to assume that this is the same Weston Farmer. 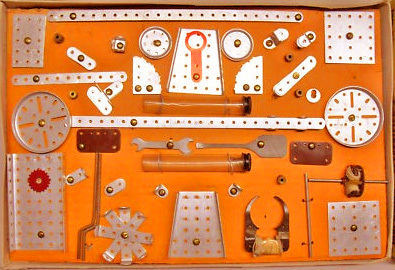 How he came to have his name on this line of contruction toys would be an interesting story. By 1947, for reasons unknown, the published (final?) 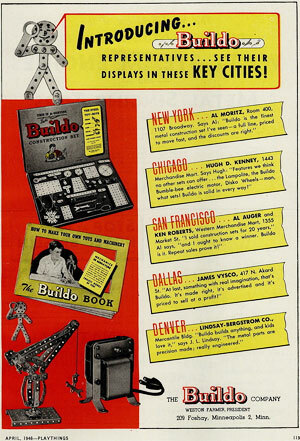 address for the Buildo Company had changed to Tacoma, Washington. Why and when the company finally went out of business is also unknown.